In the event of a power outage, how will you access your essential business files? As outlandish as such a concern may seem, MJM, a premier marketing and communications agency, remembers their blackout clearly—and the frustrations it brought with not being able to access their files, even more so. 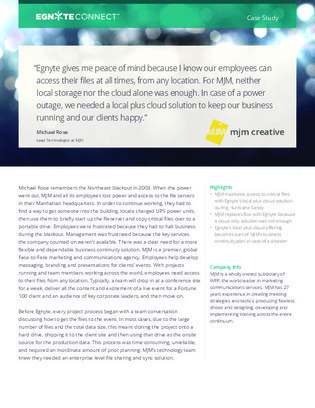 In this case study, discover how an enterprise level file sharing and sync platform helped MJM decouple physical offices from file access, and give employees the flexibility to access files anytime, and from any location.